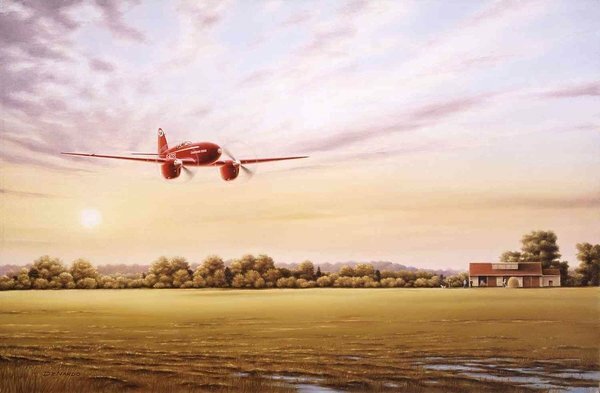 Victory Bound depicts the early morning departure of the winning DH88 Comet ”Grosvenor House”, in the MacRobertson International Air Race of 1934. The London to Melbourne race was sponsored by Sir Macpherson Robertson (better known as MacRobertson), to celebrate the 100th anniversary of the founding of Victoria, Australia. The race was also seen as a means of reducing Australia’s isolation. Geoffrey deHavilland of the deHavilland Aircraft Company was determined that his company would design and build the winning racer. In January, 1934, with a team led by chief designer A.E. Hagg, work began on the three DH88 Comets that would compete in the race. The airplane design was a sleek, low-wing, twin-engined cantilever monoplane with an enclosed cockpit, variable-pitch propellers, flaps and retractable landing gear. The construction was entirely of wood with a stressed-skin wing structure. Powered by two Gipsy Six air cooled racing engines that could produce up to 230 hp each, the Comet was capable of exceeding 200 mph. The fuel capacity was 257 gallons. In only nine months, the three Comets were completed, tested and ready for the race. Twenty aircraft participated in the race, which began on Saturday, October 20th, 1934. Compulsory stops were made at Baghdad, Allahabad, Singapore, Darwin and Charleville with the finish at Melbourne. The grueling 11,300 mile course tested the pilot’s skill with challenges of difficult navigation, inclement weather, fatigue and nocturnal flight over mountainous and barren land. The Comet, racing no. 34, ”Grosvenor House”, with Charles William Anderson Scott as pilot and Tom Campbell Black as co-pilot, was the first to cross the finish line at Melbourne with a total elapsed time of 70 hours, 54 minutes and 18 seconds. Scott had also set the previous England to Australia record in October, 1932. Scott and Black had made an agreement that neither would participate in the race unless they flew together. The brightly painted red aircraft, registration G-ACSS, was ordered by A. O. Edwards. As Chairman and Managing Director of the Grosvenor House Hotel in London, Edwards had the name of his hotel painted on the aircraft. Of the three Comets built for the race, ”Grosvenor House” was the outright winner while another Comet placed fourth. Some 50 years after the race, G-ACSS ”Grosvenor House”, the sole surviving Comet, underwent a complete restoration. The Comet is very special in British aviation history and today holds its rightful place among other historic airplanes in the Shuttleworth Collection at Old Warden Aerodrome in Bedfordshire.